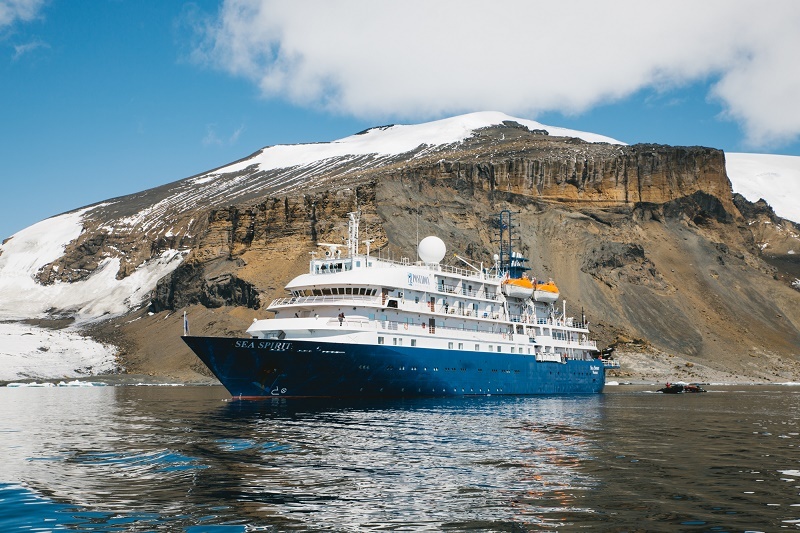 In this latest journal post here at WILDFOOT, we are continuing to tell the story of one of our employees’ Antarctic adventure cruises, in which we are proud to specialise. 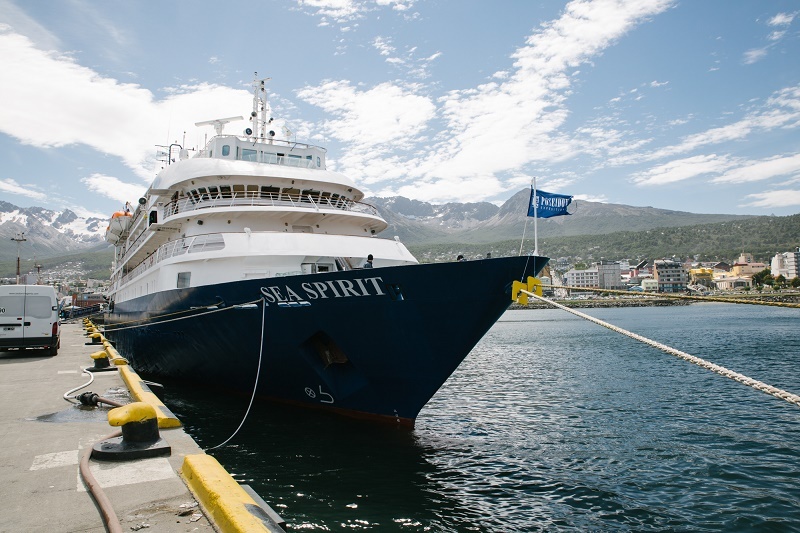 The third day of the trip sees our intrepid traveller embark on the Sea Spirit and set sail down the Beagle Channel. As I pulled back the curtains from the hotel room window, I could see the Sea Spirit in the harbour, gleaming in the early morning light. I could not believe my luck, day two of bright blue cloudless skies, I can assure you is not typical of Ushuaia. After the group briefing I took the free shuttle-bus into the town centre to explore a little bit more. Unlike the day before when there were three expedition ships in the harbour, Sea Spirit was taking pride of position, being the only such moored today. Over 30 ships now take visitors down to Antarctica, it is big business nowadays, but strictly self-regulated. At WILDFOOT we feel ship and itinerary choice are very important if clients’ expectations are going to be met. 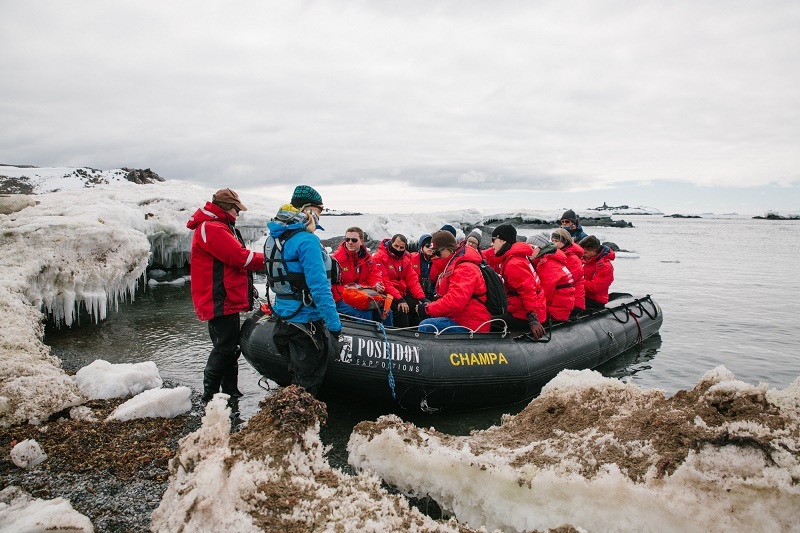 Most ships belong to IAATO (International Association of Antarctic Tour Operators) who have operational guidelines for its members, but the environment always comes first, WILDFOOT have been a member of IATTO for many years. After a mooch around town I just had time for one last dip in the infinity pool at the hotel before our 3.30pm transfer down to the pier, ready for embarkation. The Sea Spirit could be described as a mid-sized vessel, with her ‘small ship’ feel and ‘large ship’ quietness and stability, making her a favourite with our clients for some years. Before I knew it, I was onboard and settling into my cabin, I had kindly been allocated a veranda suite which comprised two single beds, plenty of storage space, a sofa, small desk and chair, ensuite bathroom with a shower and a small balcony with two chairs on it. There were plenty of power points for charging batteries and running laptops which is always a relief on a trip like this. I unpacked quickly as I was eager to start exploring the ship, especially the outside decks to work out the best places from which to sea watch, depending on the conditions of course! Then it was time for the welcome briefing and with my fellow shipmates we assembled in the lounge to meet the expedition team. Each ship has an expedition leader, who works hand in hand with the captain of the vessel and a team to look after the passengers on board the ship, our expedition leader was Michaela Mayer from Germany. She has been leading expeditions in the polar regions since 1994 and conducted her post graduate research in marine biology and oceanography in Greenland, Svalbard and Antarctica, so extremely experienced in this field of work. On this particular voyage she was leading a team of 12, who were from around the world with decades of experience between them so felt we were in very good hands, what’s more there seemed to be a great camaraderie between them so felt we were in for a fun trip. We set sail at 18:00. 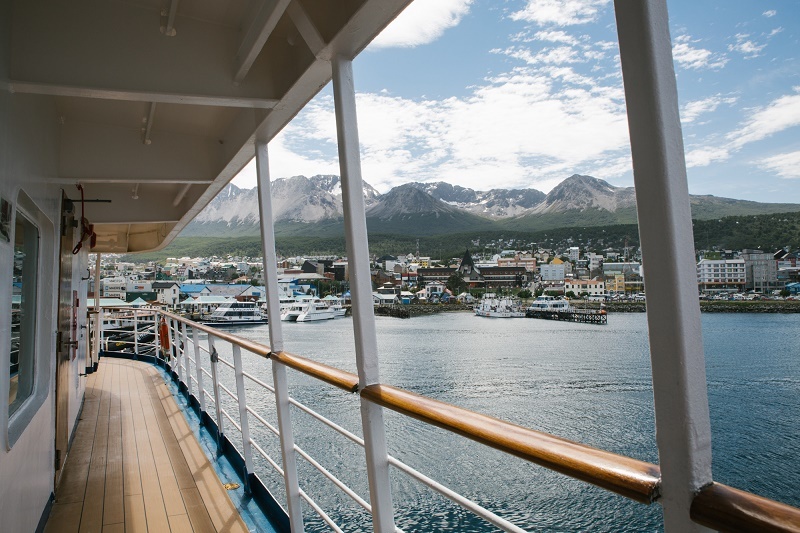 As we headed down the Beagle Channel the mountains either side of us were illuminated by the beautiful evening light, my childhood dream of visiting Antarctica was fast becoming a reality. As I stood out on deck, furiously taking photos from either side of the boat, in an effort not to miss an inch of this incredible landscape I noted a few imperial shags and giant petrels following us. Before I knew it we were being called for dinner, as always with these types of voyages, it never ceases to amaze me the quality and freshness of the food considering the remoteness of the regions in which they take place. After dinner, I retired to the bar for a cheeky nightcap and savour the sounds of Jonny Benca, our on-board musician, the perfect way to end a day.